Card Text Play: If your opponent has more than you, steal 1 . Repeat this card's effect if your opponent still has more than you. 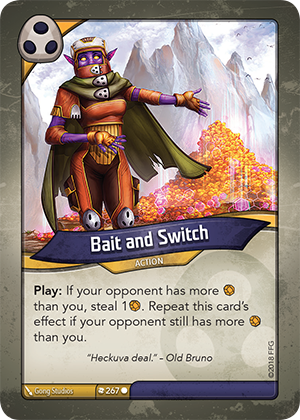 When Bait and Switch repeats its steal effect multiple times, is it limited by the Rule of Six? No. The Rule of Six only applies to playing or using cards, not triggering their effect multiple times. Therefore, you can repeat Bait and Switch’s effect as many times as needed, until your opponent no longer has more Æmber than you. Yes. When each Æmber is stolen by Bait and Switch, it goes directly to your opponent’s Ether Spider. And since only Æmber in your own Æmber pool is considered “yours” for the purpose of card effects., each time you steal Æmber, you still won’t have any in your pool, and Bait and Switch will continue to trigger until your opponent no longer has more Æmber than you (i.e. when they have zero Æmber).